When shopping in the family truckster aisle of the automotive supermarket, issues that usually matter when car shopping -- style and handling – literally take a back seat to more practical concerns. 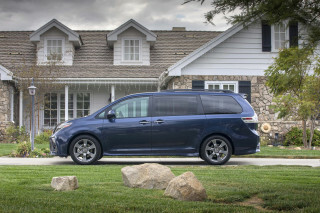 The Honda Odyssey does not break that rule, but it bends it enough that making the move to minivan ownership doesn’t have to be as emotionally wrenching as, say, buying life insurance, learning soccer schedules, and starting a college fund. 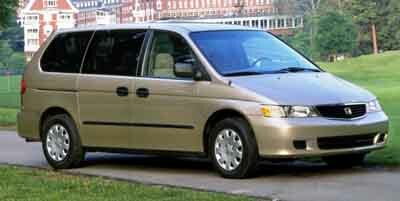 That is because the Odyssey is about as stylish as a large box on wheels can aspire to be. 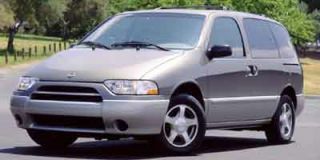 It is about on par with the Dodge Caravan/Chrysler Town & Country vans’ styling, but is a bit more angular and techno-looking than the Mopar’s flowing, organic appearance. Few other vans in the segment even approach the sugar coating that these vans give the sometime bitter pill of van ownership. What the Honda does not do as well as the Chrysler products is coddle the occupants in luxury. Leather and faux wood panels are not even optionally available in the Honda. While this is fine with many customers, there is a segment that not only likes leather seats, they appreciate their Kool-Aid-repellent qualities. At least that is the rationalization when coughing up the extra dough for the leather on other vans. The Honda also doesn’t provide the cushy ride found in some of its competitors. What the van does do is handle with a precision and authority unmatched in the class, thanks to its stiffer suspension and independent rear suspension, a class exclusive (aside from the iconoclastic Volkswagen Eurovan, anyway). 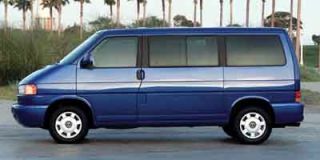 While most other vans are available with a “Sport” option package (consisting primarily of stickers for the sides that say, “Sport”) the Honda delivers the goods without the audacity to make the claim that a minivan is sporty. The laws of physics preclude a van, any van, from handling like a small, nimble sports car. 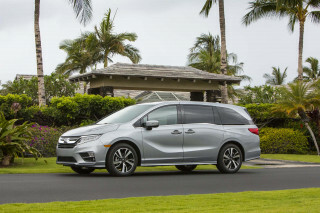 But Honda has given the Odyssey a surefooted feel, and precise, communicative steering that lets the driver know the van is doing what the driver wants. For 2001, anti-lock brakes and traction control are standard equipment on all Odysseys. Combined with the traction of front-wheel drive, the traction control system should make the Honda as capable in the snow as needed for a family hauler. Sure, with more ground clearance and four-wheel drive, an SUV might fare better in heavy snow, but in such bad conditions the responsible thing to do is to stay off the road. If ill should befall the Odyssey, the National Highway Traffic Safety Administration rates it five stars in both front and side impact protection. Unlike the Venture and an increasing number of other vans, the Odyssey doesn’t offer a factory television setup for rear seat occupants. Honda can’t meet the demand for their van, so the company hasn’t had to resort to gimmicks to sell its vans. Gimmick or not, a television system can be a godsend for long trips, and customers can consider having a unit installed by the dealer, or more affordably, by a stereo shop. On the subject of stereos, the optional six-speaker unit with in-dash CD-player is adequate for drowning out the children, but not much more. So if sound matters, plan a trip to the stereo shop. If not, the factory system will suffice. The Odyssey’s twin power sliding doors (available on the EX) are an increasingly necessary item to be competitive in the market. It is particularly convenient to be able to open kids’ doors with the remote key fob and close them with the button on the dash, if they are old enough to buckle themselves in, with never a fear of fingers being pinched in a slammed sliding door. 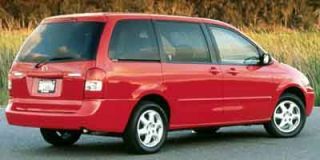 The kids would like it if those sliding doors included windows that open, like the ones in the Mazda MPV, but that is probably the only practical shortcoming in an otherwise thoroughly equipped family machine. The Honda’s hottest feature is the third-row seat, which folds into the floor. It gives users a flat load floor for carrying cargo without having to wrestle heavy seats out of the van. This also saves drivers from having to find space for the removed seats in a garage likely to be crowded with kids’ bikes and trikes. The second-row seats are removable, but they also fold forward. Doing so leaves sufficient cargo space for the Odyssey to carry 4 x 8 sheets of building materials inside with the rear door closed. Those middle-row seats may be configured side-by-side, as an offset bench seat to provide direct access to the rear seat from the right-side door, or the right-side seat can be located close to the door, providing a center aisle between two bucket seats. The middle row seats slide fore/aft and both the middle and third row seats recline, so occupants can adjust the seats as necessary to be comfortable. The 210-horsepower, 3.5-liter SOHC VTEC V-6 engine is silky smooth, and moves the somewhat porky (4288-lb) Odyssey with reasonable alacrity and efficiency. Day-in, day-out fuel economy is about 18 mpg, equal to the van’s EPA city estimate. Forecast highway mileage is 25 mpg. The four-speed automatic transmission shifts smoothly, showing Honda is continuing to learn how to build American-style slushboxes. For 2001, the shifter detents have been adjusted so that the handle actually stops in “D” instead of overshooting it and landing in third gear. 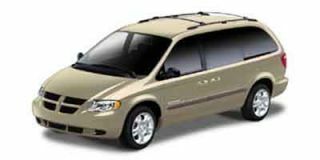 Choosing among the Odyssey, the Toyota Sienna and the Dodge/Chrysler vans is a close race. 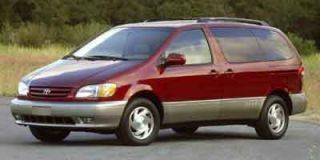 The decision should depend on the price and availability of the van (the Hondas can be hard to get, while the Toyotas and Chryslers are in ample supply), the importance of ride versus the importance of handling (the Honda handles better but the other two ride more smoothly) and brand loyalty.